APPEARANCE: Amefuri kozō resemble young boys. They wear children’s kimonos, wooden clogs, and wide-brimmed straw hats or umbrellas on their heads. They are not particularly cute, and have pudgy, upturned noses. BEHAVIOR: Despite their childish appearance, amefuri kozō are charged with the very important task of causing rainfall. Wherever they go, they cause clouds to form and rain to come down. In ancient China, amefuri kozō were thought to be the servants of the god of rainfall, who is known as Ushi in Japanese. INTERACTIONS: Amefuri kozō are shy and rarely interact directly with people. However, they enjoy stealing people’s umbrellas and wearing them as hats. They then cause rain showers to fall upon their victims. ORIGIN: Amefuri kozō became widely known thanks to the printing boom during the Edo period. They were common characters in the cheap, pocket-sized publications sold by street vendors known as kibyōshi, or yellow covers. Kibyōshi were satirical comics, heavy on illustrations, depicting urban life with easy-to-read prose. 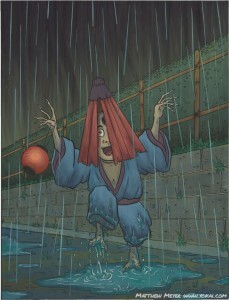 Amefuri kozō and other priest boy yōkai became popular in these adult-oriented comic books. People enjoyed their grotesque, silly, yet somewhat cute appearance. LEGENDS: Rain that falls while the sun is out is known in Japan as kitsune no yomeiri—fox weddings. 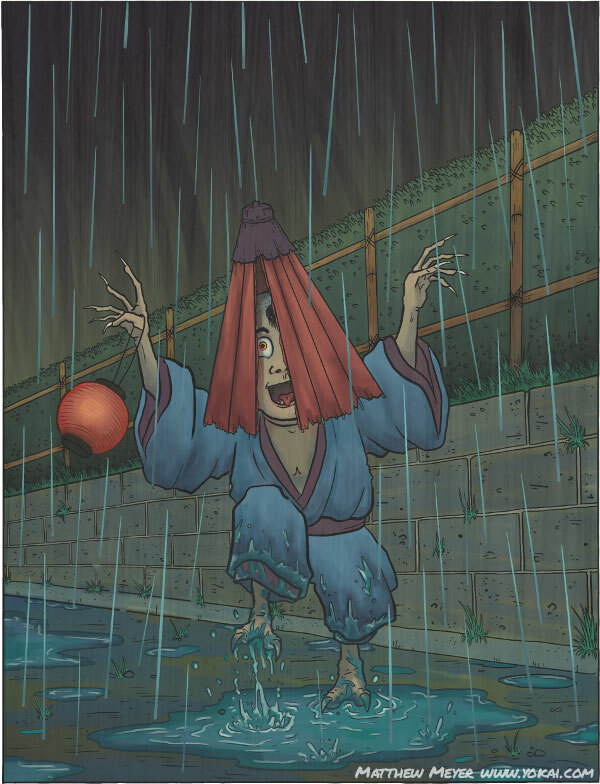 Kitsune (fox yōkai) hold their weddings during sun showers. Before getting married, kitsune will say a prayer to the amefuri kozō for rain on their wedding day.